It’s time to plant a border. A whole border. I’m not just going to stuff a few plants into the current bed. I’m starting again from scratch. But how can we achieve those brilliant, beautiful borders in our own gardens? A show garden border. Hard to match such casually thrown-together perfection at home. So I’ve been picking the brains of professional gardeners and have asked them how to plant a border. They’re there to give you ideas and inspiration, not for you to copy. 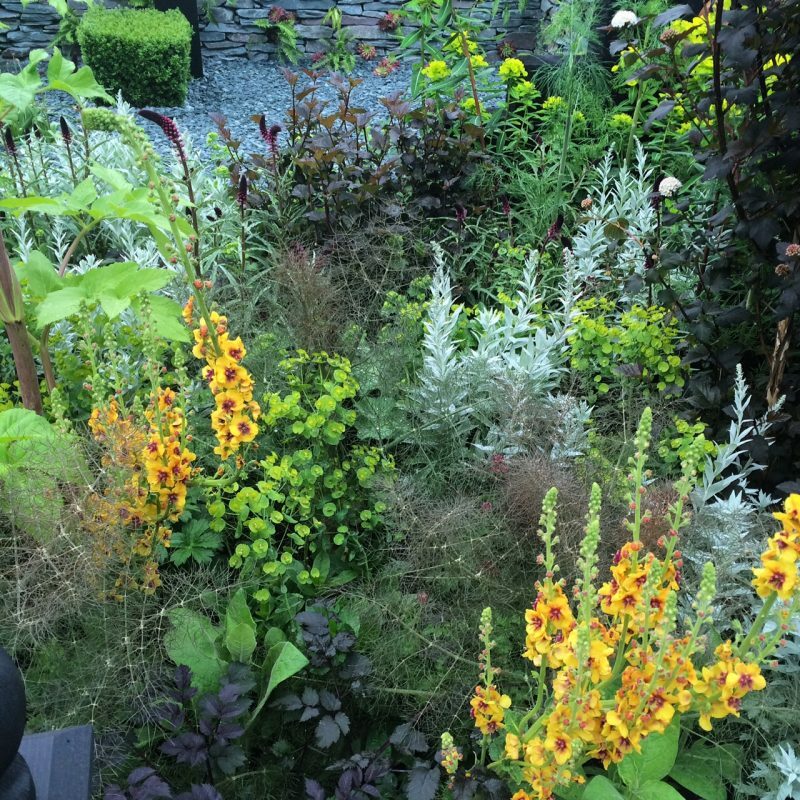 Show garden borders are like the fashion pages of a magazine. They are stuffed full of plants that have been prinked and perked to perfection. Only planted for a few days at a time, they’re jammed together and treated as if they’re in intensive care. If you’re planning to plant a border, don’t worry about whether it will look as good as a show garden. That’s not real gardening. It’s show-time. Enjoy it. 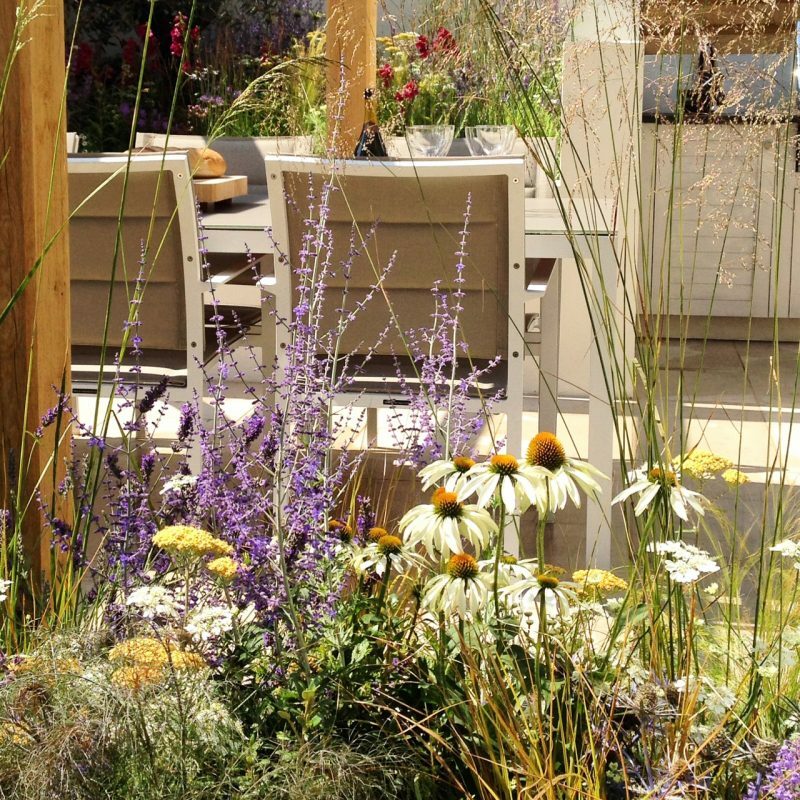 The winner of the Great British Garden challenge at Chelsea 2015 – although it’s hard to reproduce a show garden, I think this use of colour is inspiring. 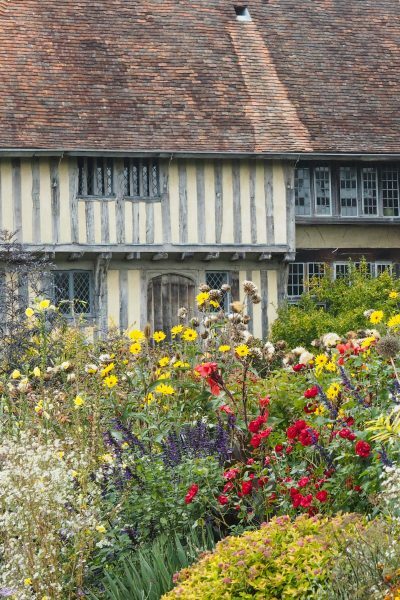 The Long Border at Great Dixter is one of the most famous borders in the world. But it is planted up by leading professional gardeners. You don’t need to feel bad about not achieving this level of perfection. Just enjoy the inspiration and the colours. Think about the width and density of the plants as well as their height. This is particularly important when you are planting a border from scratch. Borders used to be planted with the tallest plants at the back. You put towering 6ft blooms at the back and tiny 6″ flowers at the front. Now it’s fashionable to have most of the planting at the same height. 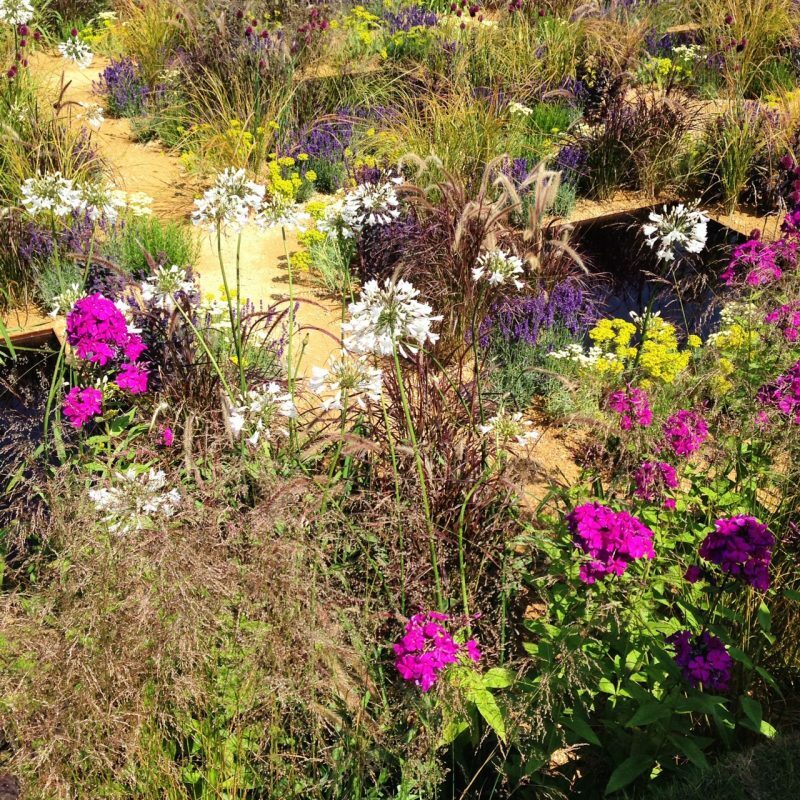 The One Show garden at Hampton Court. Planting is more or less at the same height. But plants are airy. Whichever you choose, you need to give your plants the space to grow sideways. If the label says that the width is ultimately 30cm, you need to make sure it has 15cm on either side before you plant its mate. 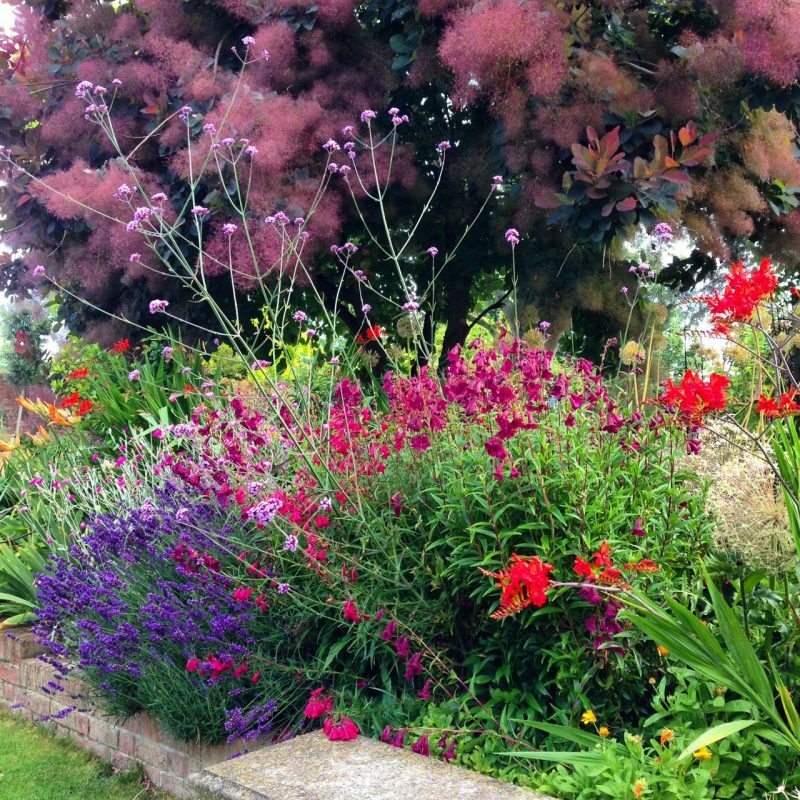 But also think about how airy or dense each plant is, before you plant a border. I planted some phlox in the middle of my new border, with some verbascum behind. Planting at the Sussex Prairie Gardens. It’s airy and modern. Plants aren’t graded by height but are see-through. Now I know why I never felt my penstemons looked right. They were no higher than the plants around them, but they sat in a solid chunk. They didn’t flow into the planting around them. I think I’d have liked them more if they’d been on the middle or at the back, rather than looming over the front and blocking everything behind them. The penstemons (dark pink, centre) were too chunky at the front of my border. But you don’t find anything out about plant density on the label. If you buy your plants from a nursery, you should be able to find someone who knows about horticulture who will help you. Or Google ‘plant name + images)’. Some of the pictures will show the whole plant. Here at Borde Hill Gardens in Sussex, you can see a tall airy flower (Verbena bonariensis), combined with the more solid block of dahlias, and contrasted with the architectural shapes of the big leaves behind. 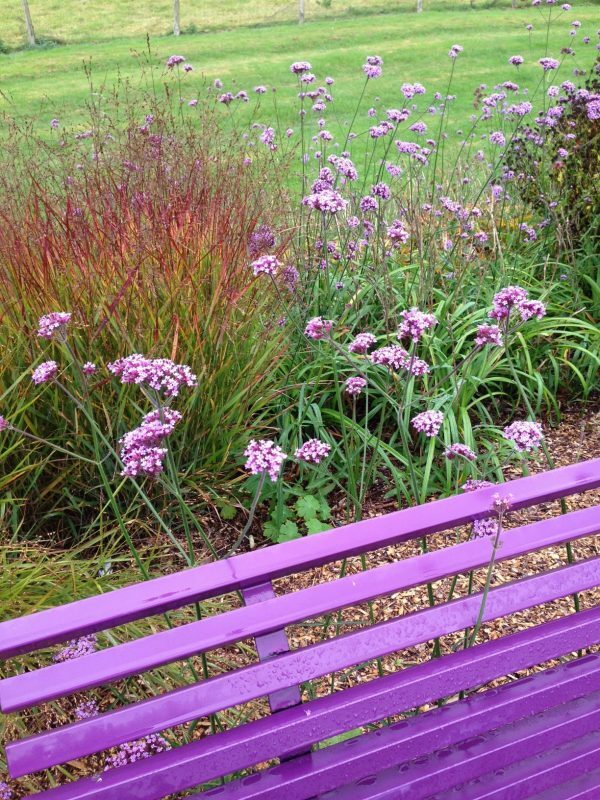 Many perennials take more than a year to reach their best. I’ve often bought plants from a nursery or garden centre, then been disappointed with their performance. But many herbaceous perennials won’t look their best the year you plant them. They’ll be better next year. After that they’ll go on looking good for a few years. So don’t be discouraged if they don’t look interesting when you buy them. My acanthus mollis ‘rue Ledan’, for example, has taken three years to find its feet, but it looks as if it’s going to be lovely this year. I planted an Acanthus mollis Rue Ledan (the all-white one) in front of this statue two years ago, but in this picture, it’s still just a clump of leaves. 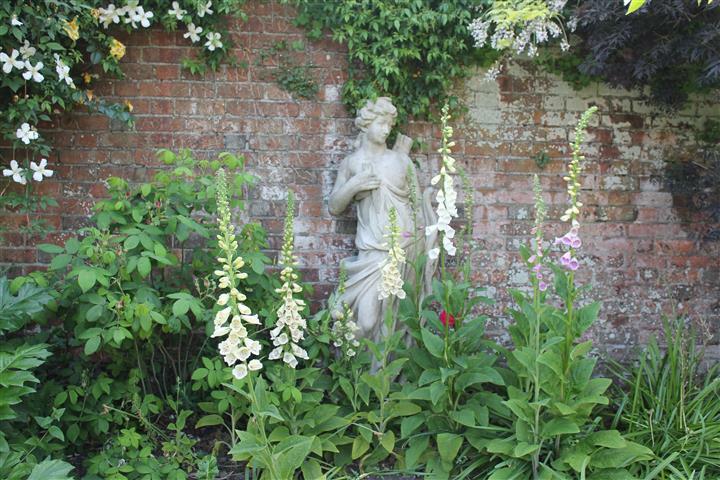 The foxgloves have kept the interest going while the acanthus finds its feet. And here it is! Acanthus mollis ‘Rue Ledan’ three years after planting. I think it was worth the wait and I love it with the black leaves of Black Elder (Sambucus Nigra). 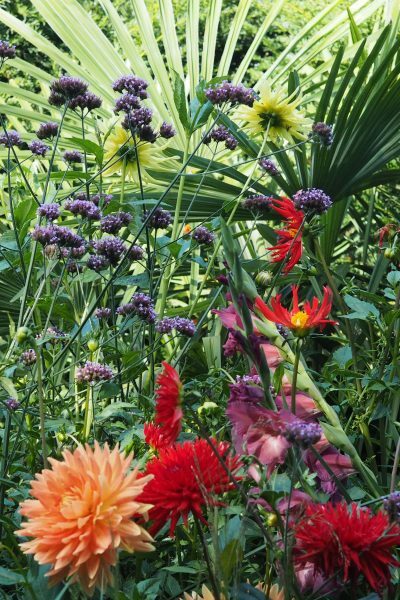 4) So fill your gaps with border annuals. There’s a huge amount of snobbery about common annuals for borders. But there are lots of attractive plants that will plump up your borders while the perennials get established. Posy thinks we should look at begonias again, and a massed planting of cosmos always looks fabulous. Cosmos, antirhinums, nicotiana, gazania, zinnias….annuals are rather colourful. Most also come in white. Zinnias are a useful and reliable annual. It’s very difficult to stick to six, but the main point is that drifts or clumps with lots of the same kind of plants are more effective than planting just one or two of each plant. There’s more about this here, and also on this video. You need to soak the plants in water in a bucket (or the sink) before planting them. Arrange your plants (still in their pots) in the border in the pattern you intend to plant them. Change around until you get the effect you want (although that’s more difficult when they are still relatively small). These plants are all still in their pots. This is the point at which Posy warned me not to have the phlox in front of the verbascum, so I swapped them round. Dig a hole that is larger than their roots. Garden author and expert Sarah Raven teases out the roots of plants – or even tears a few tendrils away – so that the plant doesn’t go in with all the roots curling round in its pot shape. Add some compost or fertiliser. See my post on fertiliser here for more information. Professional gardeners always start by looking after their soil. They add a layer of compost at least once a year. But if a border is crowded, they often add extra fertiliser. 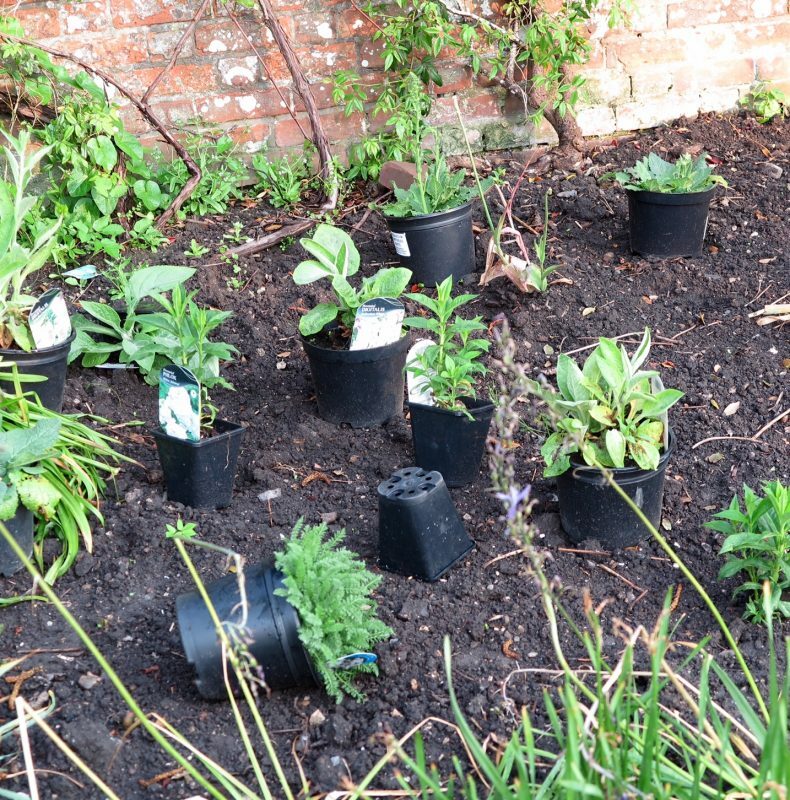 And if you’re filling gaps between your perennials with annuals, then they’ll be growing fast and needing extra. Water well until plants are established. If you have a dry spell or a dry summer, you’ll need to water new plants regularly for the whole season. 8) What is the best time to plant a border? Autumn and spring are the best times to plant a border. But the beauty of container-grown plants is that you can plant many of them in the summer as well. 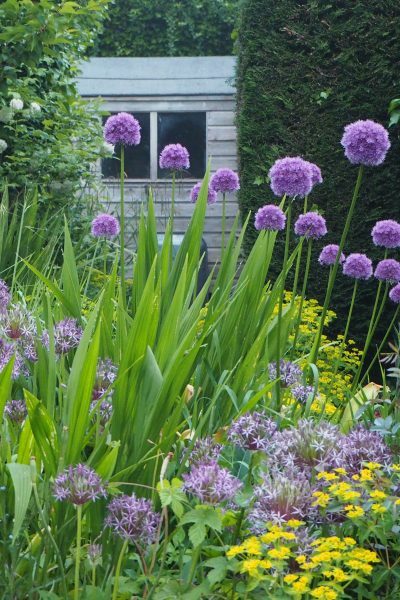 If you are planting your border in the summer, make sure that you water it regularly. Your new plants won’t have established their root systems yet. It’s not generally a good idea to plant a border in the winter. The soil may be too wet or cold. If you’re time-poor, and want a beautiful garden which doesn’t take too much looking after, see my post on brilliant low-maintenance plants. 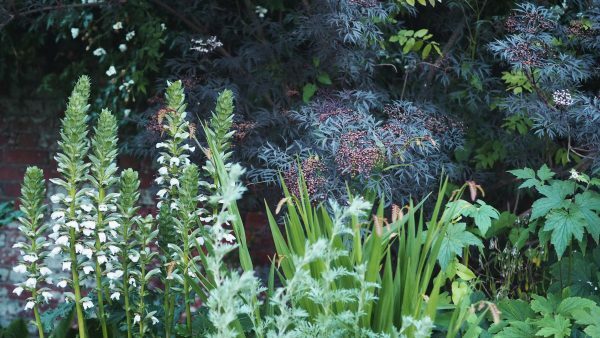 And if you have a shady side of your garden, find out why the shady borders are often the easiest to look after and go on looking good for longer. If you love the abundant effect of a cottage garden, with loads of colour and texture, then consider self-seeding plants. My 25 best self-seeding plants add so much to my garden! And they’re very little trouble. These alliums and euphorbia self-seed vigorously in our border. And No Dig gardening can be another good way of saving effort in the garden. 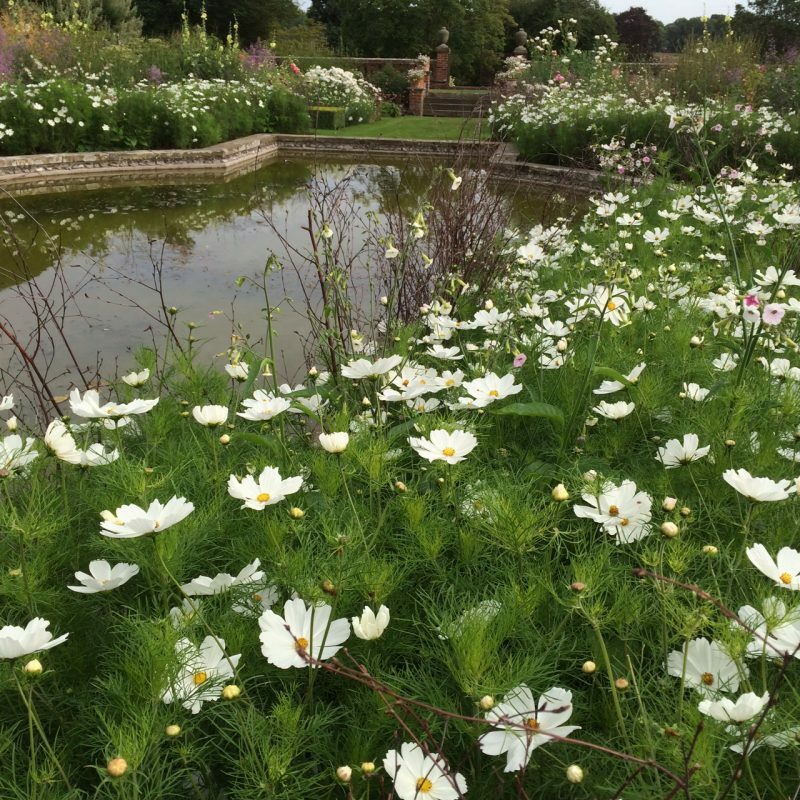 Here Charles Dowding explains why no dig is easy, weed-free and brilliant for flowers as well as for vegetables. 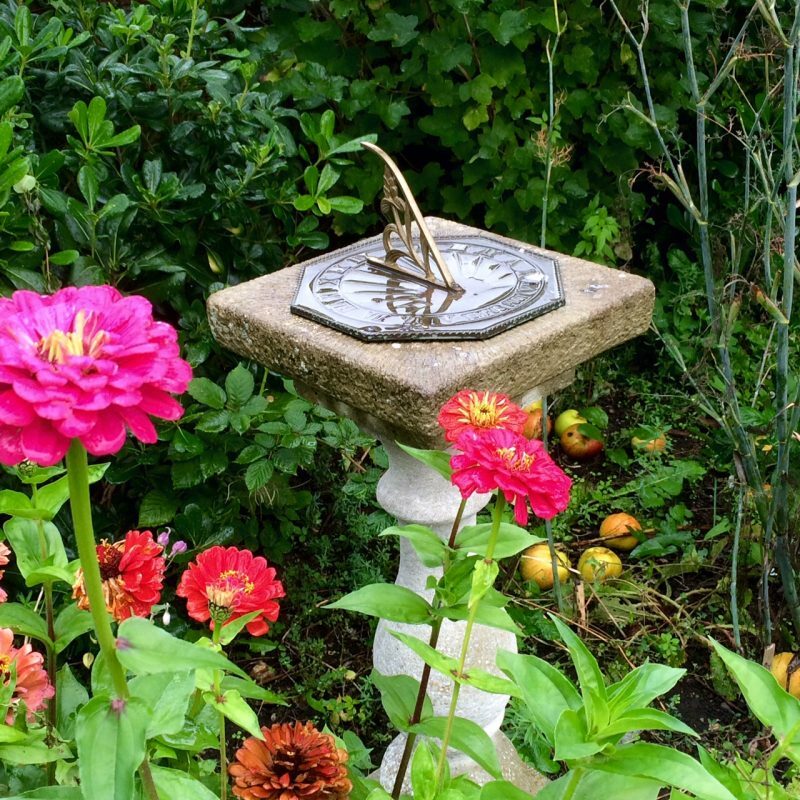 Join us every Sunday morning on the Middlesized Garden – just add your email to the box on the top right, and we will fly into your in-box when the sun comes up. And do share this, using the buttons below – thank you! 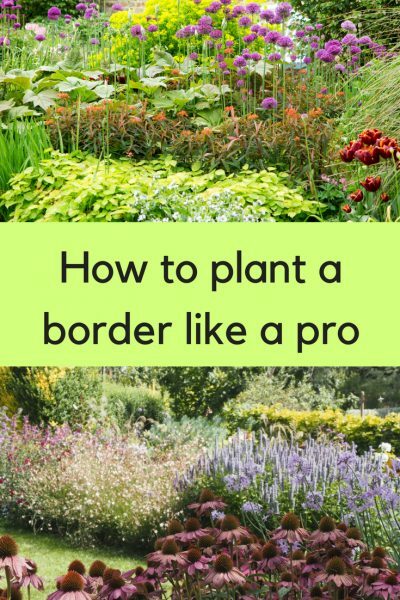 8 comments on "How to plant a border like a pro"
I always just sort by height order, which might be a bit boring ant not very professional looking but has the advantage of being simple and logical. I get frustrated though that the height quoted on websites like the RHS normally seem to include things like the flowering stems, which are temporary and don’t block light much normally anyway. The only reason I want to know the height is to make sure each plant doesn’t overshadow its neighbours too much, so for me the numbers quoted aren’t helpful. Thanks Alexandra, I really enjoyed this post! I hadn’t thought about density of plants at the front of a border. I was just thinking about mixing in some nicotiana and fennel and think I might reverse them so the fennel is at the front rather than behind so I don’t get a block from the nicotiana. So, good timing thank you! Thank you – not my intel, of course, but Posy’s – she’s very good at looking at a border and seeing what works and why. Nicotiana and fennel sound heavenly together. Very encouraging to us novice gardeners to see that even the experts sometimes have to replace or discard plants that just aren’t working in particular positions. Love the zinnias and the acanthus with white foxgloves. I planted assorted tulips (supposedly a mixture of mauve and blackish-red) only to find, annoyingly that quite a few were rather gaudy striped red and yellow – is colour-blind planting ever acceptable?! That’s always so annoying, if amusing – if you bought them from a tulip supplier, you could complain to them…on the other hand, cheery mistakes are always so heart-warming for everyone whose tulips did come out the colour they thought they’d be (are there any such perfect beings?). I am struggling with planting and so it was good to be reminded that Show Gardens are just that and my ‘mistakes’ are ‘normal’. Thank you. A pleasure. Thank you for commenting.